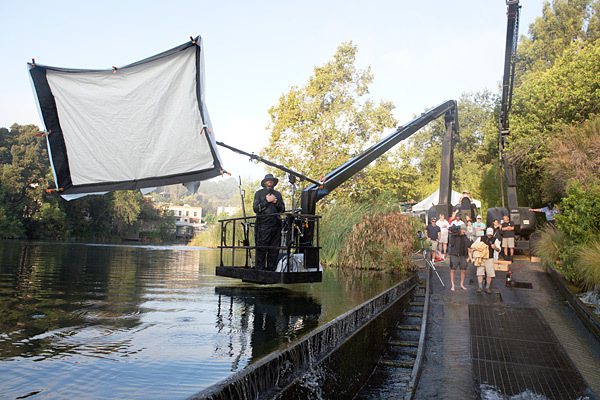 SYNC had the pleasure to work with San Diego based shooter, Tim Mantoani and Producer Mark Hofmann on a recent shoot for the National Guard at Universal Studios. There were 6 shots scheduled for this 5 day shoot during a 100 + degree heatwave in L.A. SYNC Crew members Scott Byrne and Spencer Amon combined with Chris Park and Shawn Cullen to round out the photo dept. 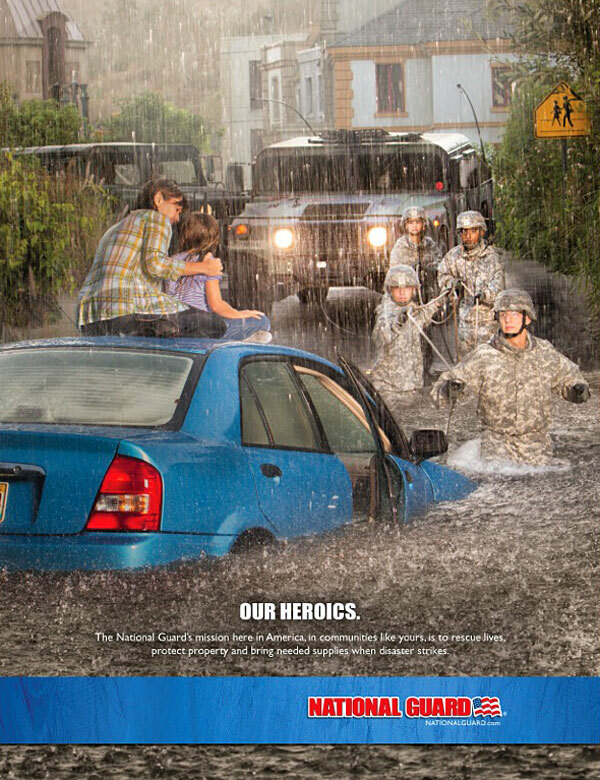 The campaign, created by LM & O Advertising and the National Guard has recently begun and the following two Ads are currently running. We will post the new ads as they are released, so check back with us! This image was put together with the help of Master Set Builder, Peter Gick. His team constructed the lower half of this building to seamlessly line up with the second floor – allowing for Peter to submerge the reproduction of the 1st floor (along with a stop sign and street signage) in a lagoon at Universal Studios! The two sections were photographed separately and pieced together in post. This image was shot at dawn in the “Red Sea” section of the Universal Studios Tour where the water is drained out of the tramway. The vehicle was positioned and secured to a steel deck riser the night before and during the pre-dawn hours after talent was brought in, the water was pumped back in. A rainmaker was used as well and a cherry picker (for lighting). There were many, many difficult aspects to this image and they all needed to come together in a few hours so Universal could start their Tram Tours promptly at 9:00am! « Profoto Air Remote Now Available at SYNC!